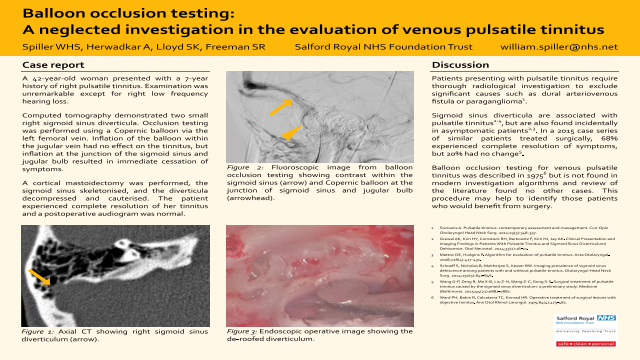 Abstract: Patients presenting with pulsatile tinnitus require thorough radiological investigation to exclude significant causes such as dural arteriovenous fistula or paraganglioma. However, in many patients, imaging will reveal only venous abnormalities also found incidentally in healthy people. Balloon occlusion testing is a useful investigation in such cases. We present the case of a 42-year-old woman who presented with a 7-year history of right pulsatile tinnitus. Examination was normal; pure tone audiometry showed right low-frequency hearing loss. Computed tomography and CT venography showed two right sigmoid sinus diverticula. Occlusion testing was performed using a Copernic balloon. Inflation of the balloon within the jugular vein had no effect on the tinnitus, but inflation at the junction of the sigmoid sinus and jugular bulb resulted in immediate cessation. Surgical decompression of the sigmoid sinus diverticula was performed; at follow up the patient had complete resolution of her tinnitus and hearing loss. It has been shown that sigmoid sinus diverticula are more common in patients with pulsatile tinnitus, thought to arise by bone conduction of turbulent flow within the diverticulum. In this patient treatments considered included ligation of the internal jugular vein as well as transmastoid decompression of the diverticula; the findings at occlusion testing suggest the former may not have been successful. Balloon occlusion testing for venous pulsatile tinnitus was described in 1975 but is not found in modern investigation algorithms and review of the literature found no other cases. This case demonstrates its utility to the radiologist and otologist in diagnosis.Summary: Balloon occlusion testing is a neglected but useful technique in evaluating patients with pulsatile tinnitus and sigmoid sinus diverticula, and may help to identify those patients who would benefit from surgery.References: Sismanis A. Pulsatile tinnitus: contemporary assessment and management. Curr Opin Otolaryngol Head Neck Surg. 2011;19(5):348-357. Grewal AK, Kim HY, Comstock RH, Berkowitz F, Kim HJ, Jay AK. Clinical Presentation and Imaging Findings in Patients With Pulsatile Tinnitus and Sigmoid Sinus Diverticulum/Dehiscence. Otol Neurotol. 2014;35(1):16-21. Mattox DE, Hudgins P. Algorithm for evaluation of pulsatile tinnitus. Acta Otolaryngol. 2008;128(4):427-431. Schoeff S, Nicholas B, Mukherjee S, Kesser BW. Imaging prevalence of sigmoid sinus dehiscence among patients with and without pulsatile tinnitus. Otolaryngol Head Neck Surg. 2014;150(5):841-846. Wang G-P, Zeng R, Ma X-B, Liu Z-H, Wang Z-C, Gong S-S. Surgical treatment of pulsatile tinnitus caused by the sigmoid sinus diverticulum: a preliminary study. Medicine (Baltimore). 2015;94(21):e882-e882.